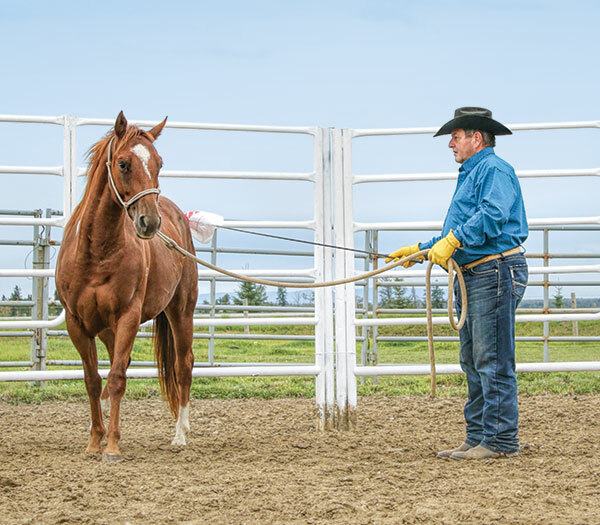 It’s easy to overlook the importance of the first few weeks of training on a young horse. After all, the spectacular performances which take place at the spring branding, or the rodeo or show arena, do not happen for several months or perhaps even years after the colt was started. Yet, those first few weeks of training the young horse can delay his ability to perform to his very best by several months, and maybe even keep him from ever being the best he can be. In this series of six articles I will discuss the steps necessary to start a young horse and provide her with all the necessary foundation so that she can go on to be the best that she can be. 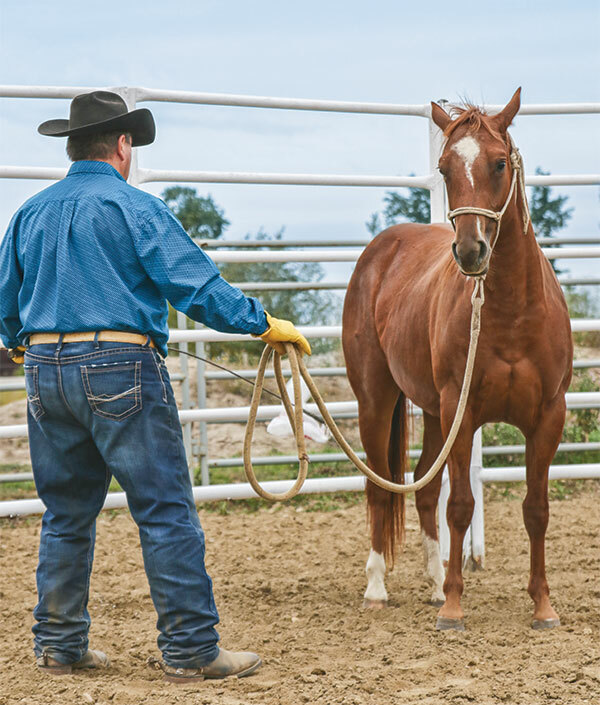 This approach will save you hours if not months of re-training on your horses by relaxing the horse and building trust in you as a partner to the horse. It will build your horse’s confidence by the fact that any change in behaviour, however small, will be rewarded with a relief from pressure. 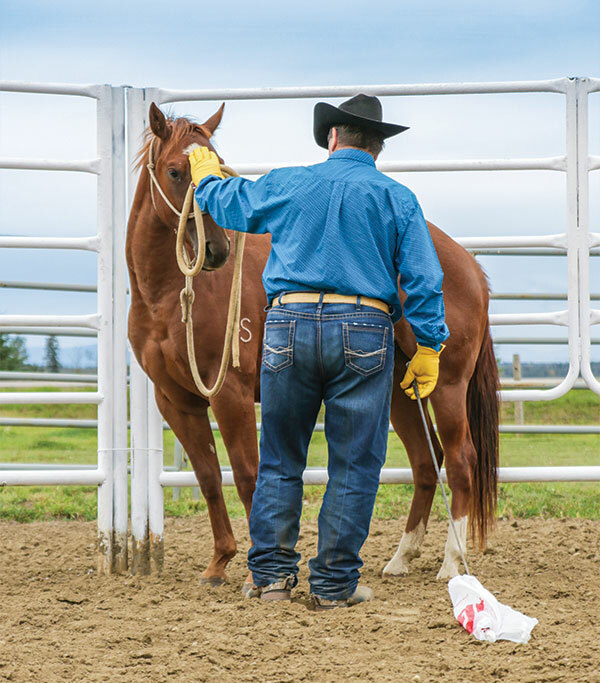 Throughout this process you will show your horse that the desired response is more comfortable than all the other undesirable responses. 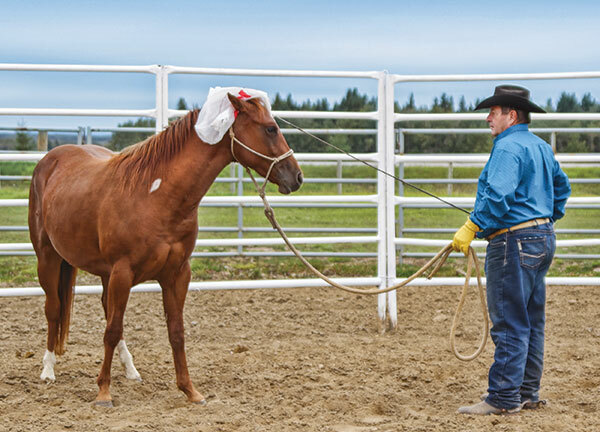 The horse will learn that the more she seeks to respond to your cues of “Let’s do this please,” the sooner the pressure goes away and the sooner she finds solace. The result is a horse that trusts you, has no fear, is relaxed through the body, willingly and readily moves away from your aids, and is able to perform any task to the very best of her ability. In this first instalment of the series I will address the topic of desensitizing. Desensitizing is the process by which a green horse becomes accustomed to the sight and feel of strange objects about her and on her. The goal in desensitizing the young horse is to let it become her idea to stand and accept the saddle and various other foreign objects about her and on her. This is accomplished by allowing her to move when an object frightens her and by removing the pressure from the frightening object when the filly makes an attempt at dealing with it by diminishing her fright response, lowering the head, showing an interest in the object, and eventually relaxing. Since she is allowed to flee the frightening object, the filly is not trapped and has a choice in her response. By removing the frightening object immediately as the filly makes an attempt at relaxing and accepting it, she learns that if she choose to accept the object, it will not hurt her and in fact becomes a non-threatening item. 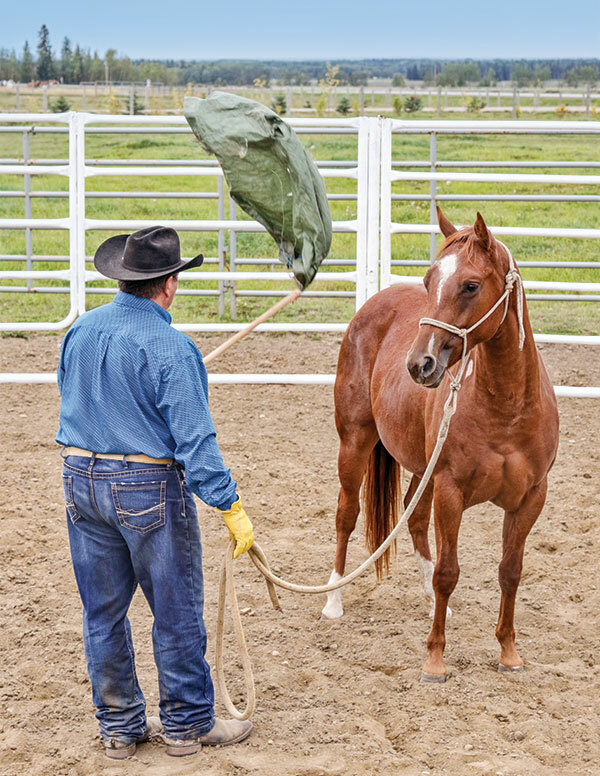 Through this process, a horse learns to accept all manners of objects with no fear because they have the choice to accept or flee, and make the decision to trust and stand. The key to the success with this approach is the timing at which one removes the pressure from the frightening object. You must take the object away from the young horse just as soon as she demonstrates a small change in behaviour. The process works this way: Holding the filly in one hand, I slowly bring the flag to her. As I bring the flag to her she becomes tense and prepares to flee. Before she flees, I take the flag away and reward her by rubbing her between the eyes. Taking the flag away from her takes away the pressure and rewards her for accepting the flag as it travelled towards her — even when the flag travelled towards her only a very short distance. Rubbing her between the eyes builds trust. Repeat the process by bringing the flag towards her again and taking it away before she flees, rubbing her between the eyes or perhaps on her neck or shoulder. In time she will allow the flag to come closer to her and eventually touch her. Once she accepts the touch of the flag, begin to rub her body with it. Your goal is to rub her entire body, from the withers, over her back towards the croup, down the hind leg all the way to the ground, up the front of the hind leg to the flank. Continue following her underline, all the way to her elbow, down the back of front leg and up the front of it, under her neck and jaw, around her nose and up her forehead to her ears. If at any time, you reach a spot on her body where she is “touchy” and gets tight, remove the flag and start over again at the withers, approaching the spot as many times as you need for her to accept the touch. Continue this process until the filly accepts you touching her all over her body with the flag. Once the filly accepts the touch of the flag all over her body, I like to repeat all the moves with a larger flag. I feel this better prepares the filly for larger objects such as a saddle or even a rider on her back. If I have rewarded the filly by taking away the object at her smallest effort at accepting the source of her fears, it will become her idea to trust, relax, and accept. At this point she will be ready for the next step in the colt starting process. Next time: Suppleness and moving the limbs. This is wonderful well explained..wish I could download it for furture references. 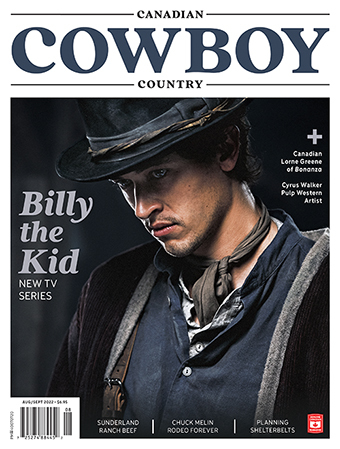 I am well … retired now and would love to try to break another colt. not sure it is smart but did it years ago..I move slower now but I love to work with young horses. I enjoyed this read so much thank you. Makes me feel like trying again (but will see) lol!